Walking out to the backyard, nature will present itself. Always take a camera. Mind you, opportunities to take a picture of nature in South Florida are common. I didn't expect just how common it was when I made the decision to pitch it all in Philly, and fly to Florida for a new home. Having had Black Racer Snakes in my Florida Room, more lizards than I can count on any given wall both inside and outside of the house, and spiders that are larger than a small car in the eaves, I have grown both amused and expectant of the creatures. After all, I ran a Frog Hotel for quite a few years until the Impact Windows got put in. The frogs left and I am disappointed that they haven't come back. This particular afternoon, I was being dive bombed. Oh sure, there were Monarchs everywhere as usual. After all there were two caterpillars turning one plant into sticks at the same time. This was something different. This Orange and Black creature was not a Monarch. It was a different kind of Florida Butterfly. It was insistent that I follow it. After all, it was orbiting my head like stars after a cartoon character gets hit in the head by an anvil. No, I mean literally orbiting my head. Round and round as I walked past the spa. I got about half way down the yard and it left me. The silly creature fluttered over to my Mango tree and parked itself there. The Mango was a tree that was imprisoned in too small a pot for years until I finally freed it by chopping the pot away from its roots. On a very hot day, I dug a hole in the yard and stuck it into the ground. They say it is a Condo Mango and won't get more than 10 to 15 feet tall or so, so I'm hoping. 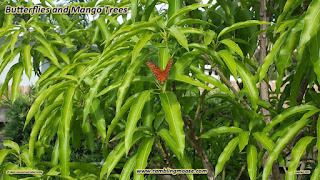 The Mango immediately showed its appreciation by dropping almost every old leaf and then following with a complete coat of deep green leaves. It's a very happy plant that went green almost in a day. The butterfly decided it liked it too. It was there, on a Mango leaf and I swear it turned its head to watch me. Reaching into my pocket, I was able to get exactly one picture out of the encounter. Then the little orange and black creature fluttered away. Over the house and into the beyond to live out its fluttery existence. "One is all you get" it seemed to say. Wildlife encounters are best when the wildlife insists on a selfie before it goes.